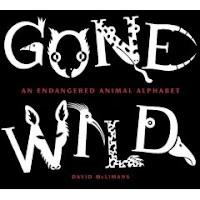 Gone Wild: An Endangered Animal Alphabet by David McLimans. Library copy. Picture Book. The Plot: An ABC book featuring endangered animals. The Good: Alphabet books serve multiple functions. Sometimes, it is the obvious -- to teach the alphabet, to teach what words begin with what letters. Pure literacy. Which is cool. But that's not this book; here, it's a device used to teach about endangered animals. Each letter illustrates a different animal. Black letters on white pages have been made to resemble parts of animals; sometimes it is easy to tell, sometimes it is more elaborate. You can see some of that on the book cover. It's inventive, it's fun, and it's gorgeous. As McLimans says in the introduction, "In a way, this alphabet is a return to picture writing. The challenge for me in creating these images was finding endangered animals whose shape and form fit naturally together with the letters that begin their names." Each page contains the name of the animal, including the Latin name, a full drawing of the animal (in red), and information such as class, habitat, range, threats, and status. A sample using the letter G is found at McLimans' website. At the end of the book there is additional information on each animal. One of my 4th graders was just reading this book and was totally hooked. Now he is on a kick reading nonfiction ABC books like this with lots of info on one topic:-) Thanks for the review.